Pave the Way Foundation (PTWF) has identified and brought to light an original document from the Prophet Muhammad, indicating that Muslims must protect the "people of the book" (Jews and Christians) and their churches until the end of time. This covenant of protection was given to the monks of the St. Catherine monastery in Egypt, in 628 CE. The original, which remains in the monastery, is imprinted with the hand of the Prophet Muhammad himself. Pave the Way Foundation works to identify and eliminate non-theological obstacles between the faiths throughout the world. This covenant of protection of the Jeews and Christians was discovered through the foundation's work to encourage Islamic support for re-opening the Greek Orthodox Halki Seminary in Turkey, closed since 1971. Recently, PTWF issued five letters to the Turkish government, signed by a group of international Muslim leaders, requesting that the seminary be re-opened. The letters cited the fact that this covenant instructs the followers of Muhammad to protect the people of the book and not to interfere with the houses of their religion. The document serves as religious basis for the request to re-open the Halki seminary. If a female Christian is married to a Muslim, it is not to take place without her approval. She is not to be prevented from visiting her church to pray. Their churches are to be respected. They are neither to be prevented from repairing them nor the sacredness of their covenants. Commenting on this most important document, PTWF Advisor Sheikh Syed Agha Jafri stated, "During these days when violence in the name of religion is commonplace, it is even more significant to raise worldwide awareness of this covenant of protection. The document gives a clear order of protection, in the name of Islam, of the people of the book, means the Jews and the Christians. It is likely that very few Muslims around the world are aware that this covenant exists, even amongst the Muslim population. This should be trumpeted worldwide to oppose those whose private agendas have insulted and sullied Islam by encouraging violence in its name." Gary Krupp, President of PTWF, stated, "The enemies of peace are the extremists that exist within each of our faiths. Religious violence comes about from the 'tail wagging the dog' where extreme minorities instigate hatred and violence, violating benevolent precepts common to the Abrahamic faiths. If peace is ever to be achieved, Jews must take responsibility for Jewish extremists, Christians must take responsibility for Christian extremists, and Muslims must take responsibility for Muslim extremists." About Pave the Way Foundation: PTWF is a nonsectarian foundation whose mission is to identify and work to resolve non-theological obstacles between religions through the trust garnered from our work to initiate historic gestures between the faiths "paving the way" to removing the use of religion as a tool to justify private agendas and violence. During PTWF research with the Greek Orthodox Church, they have located numerous documents hand signed by Muhammad granting permanent protection to Christians and to their churches. 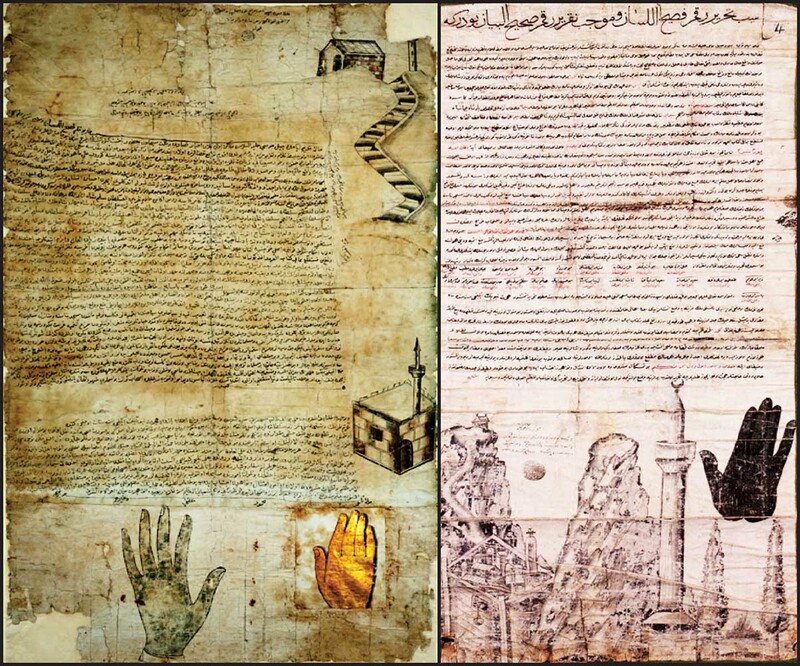 These documents have been in existence since the original order given by Muhammad in 628 ACE. PTWF has located several recent documents which sustain the original charter of rights. They question why are these mandates not known to the Muslim world? Why does the media avoid reporting these critical religious instructions? PTWF believes that any Muslim who violates these mandates is insulting Islam and insulting the Prophet Muhammad. The copies of these covenants contain a picture of hand. This image, plus original wax seals, were touched and approved by the Prophet Muhammad, Blessings and Peace be upon him. Predate the compilation of the Sunnah, the covenants carry the same legal authority as the Holy Qur'an. These covenants order the followers of the Prophet, Blessings and Peace be upon him, to protect peaceful Christians, Jews, and other allied communities until the end of days. They order that churches, synagogues and Holy Shrines must be protected. They declare that Christians and Jews are believers in one God who form an integral part of the Muslim Ummah or Community. They are not infidelss. What has happened? The existence of these covenants has been hidden from the believers, by agents of Satan who lie and pervert the goodness of Islam for their evil purposes. These agents of Satan are disguised as religious leaders to trick the good people into performing evil acts, which are not in service of Allah but only serve Satan. How many of these false leaders, who preached violence and hatred, have sent their own children out to die? PTWF and its supporters want to warn all true Muslims who listen to the lies of these agents of Satan to repent if they wish to save their souls. Do not act on their evil demands, do not give them money or any support, shun them and denounce them if you truly wish to enter paradise. They urge to true believers to join them and sign the Covenant Initiative, to expose the evil doers who only bring international hatred and fear of Islam. Current signers of the Initiative are included in this report. PTWF gratefully acknowledges Dr. John Andrew Morrow for his images of the Covenants.